Don't believe the hate. Although Fox's "Fantastic 4" franchise reboot has endured months of toxic pre-release buzz from Internet know-nothings who didn't bother waiting to see the actual movie, the finished product turns out to be an impressive and unusual hybrid of horror and heroics. It won't be for everyone—it's probably too intense, bloody and grim for kids who would be better off at the more family-friendly "Ant-Man," for example—but that's not a bad thing. This new take also is unfaithful to its source material in numerous ways, which won't please the faction of comic-book fans hoping the film will fail at the box office so Marvel Studios might regain the rights to the characters from Fox. 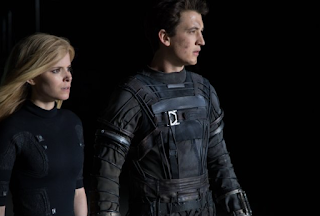 The fact that this gritty and sometimes unexpectedly poignant origin story isn't your typical lightweight super-flick actually works in its favor, allowing it to make a clean break from its two disappointing and more conventional predecessors (2005's "Fantastic Four" and 2007's "Fantastic 4: Rise of the Silver Surfer"). The new version isn't as dreadfully dismal and pretentiously self-important as Christopher Nolan's "Dark Knight" Batman trilogy, but it definitely has more in common with those downers than it does with Marvel's more colorfully uplifting Avengers outings (and those of that team's solo members). Boy genius Reed Richards (Owen Judge) gets no respect when he announces on Career Day that he wants to build a teleporter. When he's caught rummaging for parts in the salvage yard owned by the family of classmate Ben Grimm (Evan Hannemann), the two strike up a friendship that carries over into young adulthood (when the two are played by Miles Teller and Jamie Bell). Reed is recruited by Dr. Franklin Storm (Reg E. Cathey) to continue working on his project for a New York research firm. Dr. Storm's deadpan-serious daughter Sue (Kate Mara) and his street-racing son Johnny (Michael B. Jordan) also are on the team, whose wild card is the brilliant but sneeringly cynical Victor Von Doom (Toby Kebbell). A disastrous test of their resulting invention gives all of the young folks abilities they can't at first control: Reed can stretch, Sue can turn invisible and make force fields, Johnny can ignite himself and fly and Ben is transformed into a powerful rock-like monster. Instead of showing those transformations as exciting or thrilling, the movie initially portrays them as agonizing, terrifying and, in Ben's case, tragically sad. The four are imprisoned by the American military, which as usual these days is portrayed as evil, heartless and cruelly manipulative. (During the teleporter's development, a character remarks that the waterboarding US government might use the resulting dimensional gateway to disappear prisoners Guantanamo-style.) Later, audiences who give the plot a little thought can deduce that the movie's murderously sadistic villain literally has cloaked himself in the American flag (although one rendered unrecognizably stars-and-stripesless). Like the unglamorous real-world settings of director Josh Trank's 2012 teens-with-powers movie "Chronicle," the Baxter Building research lab in "Fantastic 4" looks more like a believable warehouse-type workplace than a high-tech CGI fantasyland. The fact that the hellish landscape of the mysterious "Planet Zero" is barely special-effects adequate somehow complements that retro no-frills look, giving the scenes that take place there a bygone-era SF patina. The movie's resolutely non-tongue-in-cheek screenplay (by Simon Kinberg, Jeremy Slater and Trank) has some flaws. It's impossible to believe that one member of the team would stay out of contact for a very extended period, or that none of them would go to the media to get their story out and draw attention to their plight. The movie suffers from having an unfortunately corny coda that's aggravatingly inconsistent with the rest of the film, precisely because it feels too much like a generic scene from a more traditional comic-book flick. It's better when it stays human enough to have even its more noble characters agree to hijack their invention in order to grab recognition and explorer glory for themselves, instead of letting some unknown NASA pilot have that honor. "Forget Neil Armstrong," one of them irreverently remarks, referring to the fact that no one remembers Apollo program engineers but everyone knows who first stepped foot on the moon. "Fantastic 4" offers such an interesting departure from standard superhero fare that it deserves consideration from viewers who are willing to form their own opinions about it, instead of mindlessly repeating a misguided meme.